Linguist d’Armond Speers is an odd bird. How else could you explain someone that taught his son Klingon as his first language? For the first three years of his son’s life, Speers spoke to his son only in the fictional alien language Klingon from the Star Trek universe. His reasoning? It was an experiment to see whether or not his son could pick up a fictional language as a first language, or if it had to be a real language in order for the imprinting to work. Speers is apparently a fluent speaker in Klingon, given his work on developing a Klingon-language dictionary with company Ultralingua. “I was interested in the question of whether my son, going through his first language acquisition process, would acquire it like any human language,” Speers said in this interview with the Minnesota Daily. “He was definitely starting to learn it.” Because that’s such a useful skill. 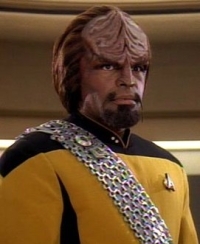 Here’s my question: when it was time for the child to learn English, how much trouble did he have adapting to a normal-sounding language, rather than the extremely phlegmy Klingon dialect?